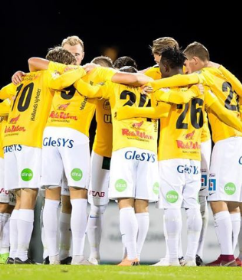 Nigerian striker Chisom Egbuchulam has confirmed one of the worst kept secrets in the January transfer window after revealing that he has decided not to extend his contract with Allsvenskan newcomers Falkenbergs FF. The 26-year-old was offered a fresh two-year deal by Falkenbergs FF but the offer from Suwon FC was too good to turn down as he is set to earn approximately four times his previous wages at the South Korean club. Writing on Instagram, Egbuchulam stated : ''It’s with mixed emotions that I’m writing this message. To everyone at @falkenbergs_ff It has been an incredible journey and it is with great sadness that I have to say goodbye. ''To The Sports director (Hakan Nelson) The coaches, my team mates and the fans of FFF I will miss you all and I wish u best of luck this season and in the future 💛💛💛💛🙏🏿''. Last season, Egbuchulam notched 14 goals in 26 appearances for Falkenbergs FF and was the second top marksman in the division, two goals behind Helsingborg's Bjarnason. Allnigeriasoccer.com understands that the former Enugu Rangers star underwent a medical with Suwon FC on Tuesday, January 15.